A graduation is a big event in your life. So, it is not a surprise that you want to look extraordinary, but in accordance with your age. You won’t stay indifferent when you see all these lovely, yet very minimal makeup ideas that we have prepared for you. 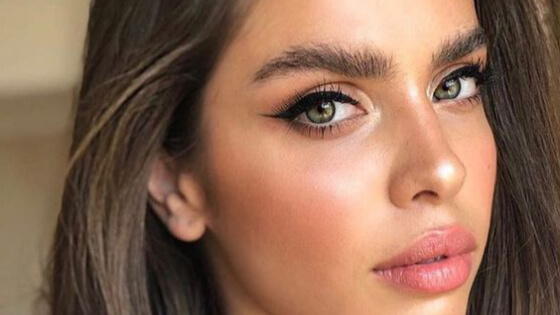 From red lips to no-makeup makeup and smokey eyes – we have gathered everything that you should try for your graduation night. Let it be one of the sparkliest ones. If your graduation occurs in spring, then look no further than this makeup. Pastel shades on your eyes – why not? Orange shade suit to girls with brown eyes and dark hair. If you are one of them – don’t hesitate to try it. Romantic and minimal – that is how we can describe this lovely makeup. It is excellent for girls who don’t want to get overexposed, still, they want to be elegant. Glamorous hair deserves glamorous makeup. If you want to stay minimal, make your face shine. A lot of shimmer and neutral eyeshadows will make your look even more elegant. Highlighter on your cheeks, neutral eyeshadows on your crease and meat-shade lipstick is everything that you will need for this lovely makeup look. It is perfect for summer graduation and flowy, elegant dresses. Lower lid usually tends to be forgotten or painted minimal. Well, for this year, opt for a pop of colors. Blue, green, or yellow – everything counts. Make sure your upper lid is a bit more neutral. Gold eyeshadow is always a good idea for a prom or graduation night. If you want to make this look even more dramatic, put on false lashes. They will make your eyes pop. Last year was all about burgundy shades. This trend lasts so if you want to look totally eye-catching on your graduation, put on a burgundy eyeshadow. Blend it with a bit of gold and apply neutral lipstick. Gold eyeshadow in the form of a smokey eye will make you look nothing less than perfect and so glam. You should match this eyeshadow with an ideal graduation dress. When you want to point out your lips, you don’t need to put on red lipstick. Meat and neutral lip shades can make a pretty good job as well. Glowy skin with neural spring tones on your face will make you simply look gorgeous. It is utterly chic and very appropriate for young girls. Shimmery eyeshadows are always good for occasions like graduations, proms, and weddings. You can add false lashes and apply neutral matte lipstick. Big brows are great if you want to achieve a natural look. You can style them according to your own needs, but let them be big. Eyeliner is a timeless part of makeup that you can always wear. The black smokey eye is one of those timeless looks that you can always count on. Combine it with your favorite lipstick, but make sure it is neutral. As well as the black smokey eye, red lips are something timeless and always in style. You can pull out this look for your graduation party without any regrets. If you want to make your makeup look gorgeous, make it precise and clear. Black eyeshadow is applied in the form of a precise smokey eye, contours on your face are minimal yet very lovely. Green eyeshadow might sound like a bad idea to you, but trust us here – it looks gorgeous on your eyelids. Combine it with a bit of yellow and orange – you will be amazed by the results. Surprise, surprise – purple eyeliner in combination with gold eyeshadow might sound like an unusual idea, but it looks terrific. You can rock this look for your graduation party. Navy blue eyeshadow makes a perfect combo with gold accessories. You can be sure your look will be noticed.